Cats are some of the most resilient domestic animals in the entire world with the oldest cat in the world recorded as being 38 years of age when it finally passed away. Unlike dogs that age rather quickly, cats can remain sprightly and active well into their twenties. The average age for a cat is between 15 and 17 with many cats living quite a bit longer. Currently, the oldest living cat known is in its mid-twenties, but who can truly claim the title is up for debate. According to the Guinness Book of World Records, the oldest-living cat ever recorded was named Creme Puff. She was born on August 3, 1967, and she lived until three days after her birthday in 2005, making her 38 years old at the time of death. Her owner, Jake Perry of Austin, Texas, lived with her from her earliest days. Although Creme Puff is recorded as being the oldest cat in the world, her actual age is a matter of some dispute. Guinness World records verifies all of its record holders' claims, so it is likely that Creme Puff was indeed as old as was claimed. All of Jake Perry's cats lived for a rather long period of time, but no one knows exactly what he did differently from the average cat owner. Unsubstantiated claims have been made of cats living into their early forties (a man in Scotland claimed that his cat was 43 in the 1970s), but rumors of cats living well into their thirties are beyond dispute. Just like the story of Puff's longevity, the title of the world's oldest cat currently living is up for dispute as well. Some cat owners claim that their felines have been around for over 30 years, but the previous record holder of the oldest presently living cat, as published by the Guinness Book of World Records, could not be verified; this allowed other felines to vie for the title. In March 2005, the oldest living cat in the world was verified to be a black cat named Spook from Canada. A 37-year-old Siamese cat named Sheba was rumored to be the world's oldest cat as late as 2009. Cat Fancy magazine found in 2007 that the oldest living cat was 29 years of age. Guinness has yet to verify the current record holder, but contests are held yearly the world over to determine the oldest cats in certain areas of the world. Although it's somewhat unlikely that the oldest cat in the world could reach the age of old Creme Puff, it is certainly possible. Potential record holders must contact Guinness, which is recognized as the world authority on record holders across the globe. Tens of thousands of possible record breakers are sent into Guinness annually, but the record book cannot accept all of them. If you're interested in seeing if your cat is a record breaker, simply complete the online registration form available at the Guinness website. After a claim for a broken record is submitted, Guinness will send you the guidelines for confirming your record. It may take several months in order for the entire application to be processed, but Guinness will send you a certificate of your feline's achievemen if you are the winner. You may be recognized in the organization's official record book. If you'd like to keep your cat around long enough for him to be a contender for the world's oldest cat record, make sure to keep him safe and healthy. 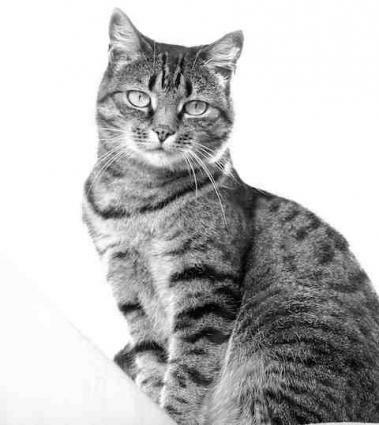 Check him daily for any problems and study older cat behavior patterns to detect abnormalities. Make sure his eyes are clear and free of discharge, and that his nose is not running. Keep his fur clean and free from fleas or ticks, and make sure his ears are pink and have no black waxy buildup. Allow your cat plenty of exercise and play time, and make sure that he's fed on a regular schedule. If there are any problems, take him to the vet. With care and attention, perhaps your cat will be the next record holder.